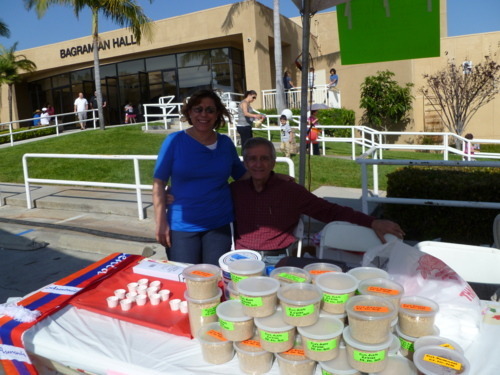 Last Saturday at the Armenian Food Festival in Montebello, California, I was sandwiched between two zahtar booths. On one side, cooks made fresh grilled Zahtar Bread. One the other side, Elo’s Zaatar sold homemade Aleppo zahtar. 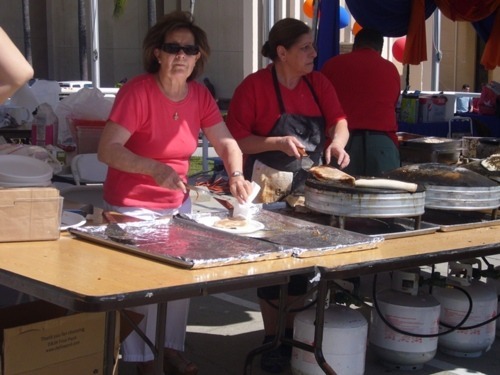 I had never seen the Middle Eastern flatbread made fresh at a fair booth before but it was fascinating to watch the process. First, a cook rolled out a ball of fresh dough into a 12-inch round. The rolled dough was placed on a domed grill and zahtar, mixed with olive oil, was generously brushed over the top. After about 5 to 7 minutes of cooking on the domed grill, the flatbread begin to bubble. The pizza was then transferred to a flat-surface grill and cooked until the bottom of the round turned golden brown. The final cook, in the assembly line of fair chefs, folded the pizza in half, removed it to a paper plate, and sliced in into thirds. Served warm, right off the grill, the Zahtar Bread was the best I’ve ever had. It was really really delicious. We went back for seconds, and then, we went back for thirds! Zahtar is a thyme-like herb that is often blended with sumac bark and chickpeas and/or sesame seeds. Most often it is imported from Lebanon and Syria and sold in Middle Eastern markets, but we were doubly lucky last Saturday because on the other side of our booth was Elo’s Zaatar from Glendale, CA. Elo makes and sells her own recipe of Aleppo Zaatar. I brought a tub of her mix home for my husband, who is also from Aleppo. He said Elo’s recipe is as good as what his grandfather used to make. Elo and her husband were not only great zahtar makers, but fantastic festival neighbors, too. 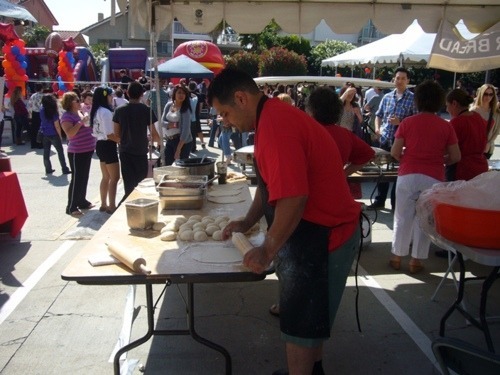 We were very fortunate to be located between the food festival’s zahtar action! It’s amazingly simple to make Zahtar Spread. Place some zahtar mix in a bowl and slowly add enough extra virgin olive oil to make a loose paste. Use Zahtar-Olive Oil on pasta like you would pesto or spread it on a thick slice of toasted bread and top with feta cheese. Yum! Or zip up a traditional side dish by adding a tablespoon to steamed spinach or Swiss chard.